Nebek (Agenzia Fides) - Pain (alam) and hope (amal) are two words composed in Arabic "from identical letters but with a completely different meaning: two words however closely linked by a bond that manifests itself in a clear and tangible way in prayer and close to God". This is how the "Christmas letter" begins sent in these days to friends, benefactors and acquaintances by the monks and nuns of Deir Mar Musa, the monastic community founded by the Roman Jesuit Paolo Dall'Oglio, who disappeared in Syria at the end of July 2013 while he was in Raqqa, at that time a stronghold of the jihadist groups at war with the governmental army of Assad. The letter begins with the reflections of Sister Houda Fadoul, current head of the community: Sister Houda recalls that "true spiritual consolations come to us from God in moments of prayer", while the possibility of giving a Christian response when we ourselves are struck by pain can only flow from the imitation and companionship of Christ, when we "unite our sorrow with that of our beloved Jesus, offering it to God for a world of justice and peace". In their Christmas letter, the monks and nuns of Mar Mousa trace a brief account of the events and the works that have marked the life of each of them in recent times, in an ecclesial and social context defined as "complex and worrying". In the long community epistle, it is said, among other things, that Father Jacques Murad, the monk kidnapped for some months in 2015 by the jihadists of the Islamic State (Daesh) - "celebrated Holy Week and Easter with Iraqi refugees in Turkey". While friar Jens, in the monastery entrusted to the community in Sulaymaniyah, in Iraqi Kurdistan, "was able to finish the construction of two buildings adjacent to the church, housing the school of languages and professional formation Mali Dangakan (The House of Voices) in the first building, which attracts "an increasing number of people, because the study of languages (Arabic, Kurdish, English) helps to find a job and a future in the region". 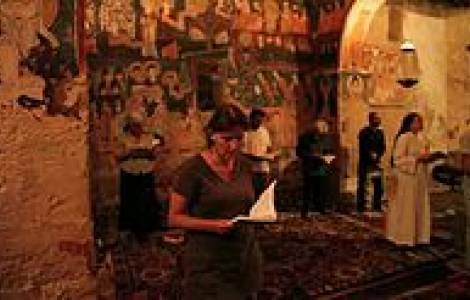 In that monastery - the monks of Deir Mar Musa say - "this year's summer school distinguished itself from the previous because it attracted a large number of children in the region, Muslims and Christians, local citizens and refugees, Kurds, Arabs, Chaldeans and Syrians. For two months, the children experienced together the joy of learning, developing their artistic talents, taking trips and playing under the supervision of qualified teachers under the watchful eye of Father Jens". Meanwhile, Sister Deema "spent most of the year in Mar Musa welcoming, listening and assisting guests, especially the young people who bear the pain of the situation in Syria in their hearts and the hope for a better future". The letter also updates on the path of music schools and children's kindergartens animated by the community, recalling that this year there are 150 children who "grow in our nursery school 'Rawdat al-Qalamoun'. The works supported for the displaced persons of the Syrian city of Qaryatayn hosted in the villages of Zaydal and Fayrouzé are also mentioned: "There were marriages, children were born" the letter reads "and this fact testifies the desire of these families to stay in Syria: and it is precisely what we hope can be achieved, providing them with help in these years".